Many talk about how startups fail b/c of product or building a product. You believe that the main source for startup failure, is for a different reason. Tell us what that is. You’ve noted five mistakes that contribute to this lack of traction and failure to acquire customers. Walk us through the first mistake. What is the second mistake and what are your thoughts on how traction should be prioritized, relative to product? The next item has to do with target market and vertical. Many investors/incubators/accelerators preach focus on a vertical or niche. What is your standpoint? How do startups often approach customer acquisition and how would you recommend they approach it? The final mistake that you cite that causes lack of traction and startup failure relates to what you refer to as “micro-opportunities.” Can you first explain what “micro-opportunities” are and then walk us through how startups fail to recognize and respond to them? From the investor standpoint, how can one apply this message to help choose startups to invest in… and what should they expect to see from startups that are fundraising? Timing: The first takeaway that I’d like to recap is on timing. Gabriel mentioned that many startups fail to address customer acquisition, channel and positioning until after a product is built, yet this must start at the idea stage and be executed in parallel with product development. As we discussed on episode 5 with George Deeb, there is a big difference between having a product built and having product-market fit. Priority: The second takeaway, while really hard to do, is on the prioritization between product development and traction. Here, Gabriel advises that founders spend half of their time gaining customer traction, which is rarely the case. It’s not intuitive to focus on customer acquisition prior to having a product to sell and so many founders don’t. And the one’s that do may get a strange response from others who question why they’re spending so much time on something that is less critical than product. But, the ability to drive sales and get traction, in Gabriel’s opinion, is just as important as having something to sell. And as was covered in the tip on MVC vs MVP, a startup can explore, validate, and test customer acquisition well in advance of having a product released. Systematic: Startups often approach customer traction randomly, without a strategic, systematic thought process. And typically it’s the easiest or the path of least resistance for the founder. Gabriel’s approach, that he called Bullseye, takes a thoughtful look at all potential channels and then allows the team to prioritize and test each. 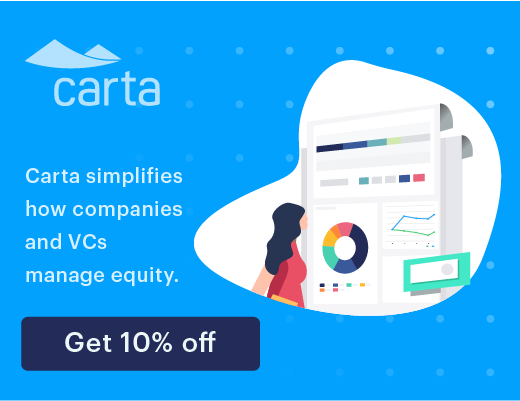 This, more exhaustive approach makes the channel strategy much more intentional and will allow the startup to focus on the most critical customer acquisition channels while justifying their strategy to their team and investors. Nick: Today I’m very excited to have Gabriel Weinberg joining us from the city of brother love. 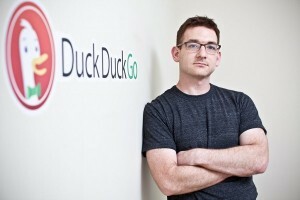 He is founder and CEO of Duck, Duck Go; author of “Traction” and has been angel investing for 5 years now and has had good successes as well as some lessons learned over at his blog at Gabriel Weinberg dot com forward slash blog. For those of us that are new at angel investing, I think his perspective is especially valuable. He has an intimate understanding of the current venture landscape both from the perspective of a founder and an investor. Gabriel thanks so much for sharing your time with us today. Nick: Awright, so the topic for this episode is Why Most Startups Fail. But before we dive in can you share with us how your journey began into Angel investing? Gabriel: Sure. So I was off my last company, I was lucky enough to have it and exit and that was in 2006. And immediately I was kind of interested in doing investing but really didn’t know how to get into it, I probably could have benefitted from your podcast if you were doing it then. So I really didn’t do much for a few years. And then when the accelerator scene kind of came on board there was an accelerator called Dream Ed that got started in Philly and I was a mentor on their first class. And one of the startups form that class kind of really spoke to me as a startup that I could particularly add value in because it was him doing a lot of things round distribution I did in my last company. And I just took the punch then and said I’m gonna figure this out I want to put money in because there’s money and figure out how to do the deal and that’s really where it began. Nick: Founders seem to love the investors that have some background leading startups and leading them to an exit. So the topic today is Why Most Startups Fail. Many talk about how startups fail because of product or because of building a product. You believe that the main source of startup failure is for a different reason. Tell us what you think that is. Gabriel: Sure so I mean now this from angel investing and then doing lost and lots of interviews for a full contraction. And what we found you know is that most startups they really do end up with a product that’s more along the line of their product vision so they don’t really fail because they don’t make a product. They fail because they couldn’t get traction and by that we mean you know sustainable customers coming to their product which you might call product market fit, and so you could call it product development but we think that it’s really different. Startups really do, do a lot product development you know lead nowadays and other methodologies. But they just don’t spend enough time on the other side, on the traction development side. You know how they’re really gonna get customers. And so well the pattern that we normally see is, you know they actually do build something that some people want but then they didn’t really think through how to get scalable distribution through any channel. And they try some things kind of halfheartedly at the end when they’re running out of money and then they can’t get any real traction to get more clients and companies die. Nick: You’ve noted 5 mistakes that contribute to this lack of traction and failure to acquire customers. Walk us through the first mistake. Gabriel: Sure. So the first on is really in that scenario that I just mentioned about trying to do traction as an afterthought after you’ve done your product and the real mistake there is not to do it in parallel with product development right from the get-go. And start investigating and investing time and some money doing experiments in what traction channel or what distribution mechanism is really gonna get your traction when you’re really ready to launch that product. So you do launch it. You kind of immediately have that wrap up and you know you’re off to profitability right away in some cases are you have enough to show for to get that the fundraise on financing. Nick: So what would the second mistake be? And what are your thoughts on how traction should be prioritized relative to product? Gabriel: So let’s assume you take my advice and you do; you start thinking about it at a time parallel with product development. The second problem is you just don’t spend enough time on it. So what we argue is that you really should spend approximately half your time on it because it’s half as important. That is really hard to do because you’re getting all this product feedback and you’re driven to spend more and more time on the product and the traction stopped the product is ready why you trying the traction; or you know you’re running experiments but you kind of time-consuming or doing un-scalable things which can be tedious. So it’s actually kind of hard to force yourself to do it but it’s really valuable to do. Because if you don’t do this in parallel with product development in the beginning you won’t figure out the right distribution channel, you won’t get traction. So you really have to; what we argue is make a, literally make a schedule; make some traction milestones. Set it up so that you’re forcing yourself to spend half your time working on traction just like you do on product milestones. Nick: Right. I recently talked about and wrote a short blog post that I called MVP versus MVC. The message was about Minimum Viable Product and Minimum Viable Concepts and it related to a startup that I saw who’s only channel was internet. And they had spent 3 years building the product. They had dumped an enormous amount into R&D manufacturing out in China. And I couldn’t believe that they had spent so much time on that without testing any of their customer acquisition considering that their only channel was internet. I mean that was something they could have tested up front. And even if they didn’t have to adapt the product in anyway at the very least they could adapt the messaging, the promotion, the positioning. Gabriel: Yeah I mean unfortunately that’s pretty hard for the startup and really leads to that you know the third mistake we see which is founders are very biased towards certain channels in this case internet right. And rightly so, internet is probably what they know but probably they want sale people are reduced to a familiar marketing or other offline trade show kind of things. But the problem with that is, you know in our research we saw a 19 different traction channels that could be used again and again print different types of channels and it’s very unclear at the beginning which channel is really the best one. You really only need one. But if you’re biased. I mean biased only trying ones that obviously you’re familiar with it or you just think you’re gonna work with some gut feeling. You really limiting yourself probably not gonna find the right channel. And so we really try to tell people to structure their traction in a way that overcomes their biases and kind of forces you to brainstorm about channels that you wouldn’t normally think about. And even experiment with them. Nick: Right. Yeah I remember reading about target markets and verticals and how you know we’re always hearing about focus and how you should focus on one vertical or a niche. But if you really don’t know sort of what channel or what vertical it’s going to hit I guess that would be a strong endorsement for testing. Gabriel: Yeah let’s suppose even that you did do good customer development right. You can understand what niche market you have to hit first you know. You have a good vertical. Then there’s still a question of what is the best figure to reach that vertical. It could be an offline event that those people congregate in once a year. It could be the case that at this event there’s a speaking engagement and you are a speaker at that event. You’re like get a traction in one shot. It might be the case that there’s no way to do that and online is the best way to do it through Facebook. But the point is like you really have to think about what is our channel. And there are a lot of them and people aren’t really thinking about them in any systematic way. Nick: Yeah and on that point from a systematic perspective as opposed to a random or an opportunistic prospective, how do startups often approach trashing and how would you recommend they approach it? Gabriel: I think they approach it in a very kind of random, ad hoc, take your metaphor like random-walk-on-Wall-Street kind of way. Gabriel: Or they often time you’re like what did you do? And they’re like well we wrote some blog posts, we tried Google AdWords, you know we went to a Meetup. Basically things that are the path of least resistance based on their previous experience and the easiest thing to do that they can think of. The problem with that is you’re biased one; and two you didn’t think about all the other channels that can be successful. And if you think about it, everyone has a lot of people on internet so startups have similar biases. So you basically are chasing the crowded channels for their underutilized channels that might be way more effective just for the sake that they’re underutilized in your industry. And so the approach that we have advised in the book we call Bulls Eye, is you know to systematically go through all the 19 channels and brainstorm ways to use them effectively and then go through a ranking of prioritizing process to see which ones quantitatively in a spreadsheet might be the most successful to you. Figure out the top 3. Do cheap experiments in parallel because you can do experiments in parallel and then if one is working you know really then focus and drill down on that traction channel see if you can get it to really work or not. If you can get it to work great you’re done you know just keep doing that until it doesn’t work. If it doesn’t then you kind of just repeat the process but the data that you just learned you keep doing it until you find the one that works. But it’s a very quantitative again systematic approach that cycles though all the different ways you can get traction as opposed to kind of the random approach where you kind of just hit a few things and not very well. Nick: So if you encounter a, startup, great idea, great team but they have not taken the systematic approach or this bull’s eye approach. How do you advise them and how do you proceed with that relationship from the investor perspective? Gabriel: Right so unfortunately I’d say it is a lot of startups that do this. I mean some startups just magically hit the product market you know kind of hit, find distribution channels right at the beginning but those are very rare. Most of the time they don’t and that’s more like your story where they even build up their product without distribution. And in that case you know I take them and help ’em and take them through the process. To be honest we do that, you know my startup too that’s how I kind of arrived at it. Is it’s kind of you want to do a systematic approach but you’re not getting traction and you try to get traction so I literally take them through that process and advise them along the way. Try to get feedback as to what experiments can be done and help them brainstorm on different things that I’ve seen work in the past. Nick: Gabriel, the final mistake that you site that cause lack of traction and startup failures relates to what you refer to as micro-opportunities. Can you first explain what micro-opportunities are and then walk us through how startups fail to recognize and respond to them? Gabriel: Sure. So this is even most important or even really relevant at the very beginning when you really don’t have much traction at all. A micro-opportunity is some kind of external event to your company has happening very quickly and you can take advantage of, if you kind of insert your startup into that. So a couple of examples with Duck, Duck, Go which is a search engine higher up. When Reddit It first came out with advertising they launched something in the news and Reddit it was kind of introductory a little bit. I saw that immediately and said wow I’m on that , I can be the first advertiser on that system basically and get amazing kind of response and click-throughs by virtue of being the first and I did that and it worked amazingly well. Other one example early on is I notice there was a trend in twitter hash tag about ducks, and our startup was named Duck, Duck, go and kind of worked with that trend a little bit. And these were very quick unfolding things. Like a week or like in the twitter case like a day. When you’re a bigger company these things aren’t gonna move and you know probably unless they’re like a big international business event or there’s gonna be a B2B company it’s like a perfect somehow opportunity to reach your customer base. But when you’re small and when you’re looking for that first traction for that first customer. See things to actually move take quite a while because our definitions are kind of external to you and they’re involving a lot of …you just kind of hook yourself unto it. You can kind of ride the waves. Nick: So circling back to your point around systemizing things, do you talk with your team as a founder and say, look we need to look out for these micro-opportunities and then we need to meet, discuss, collate them and decide which we’re going after? Gabriel: Yeah and micro-opportunities are something that startups can but day-to-day companies can’t which is why they are not opportunity for you. Because you can be nimble and you can see something come across your email today and actually just drop what you’re working on and just code something up or go out, leave the office and go seize that opportunity just to day. Whereas big companies just don’t do that. And so yeah I think it requires you to be kind of hyper-aware of what’s going on and then seize those opportunities, be nimble enough so you can just drop everything and seize them for a day. Nick: So we talked today a lot about traction, key mistakes that startups can make that can cause failure. From the investors standpoint how can one use these lessons on traction to help choose startups to invest in? And what should they expect to see from startups that are fundraising? Nick: Sure. Are you a kind of thesis investor or what kind of things are you investing in? Gabriel: I’m all seed stage; I look mostly at b2b; I will do software that’s being applied to the traditionally hardware-centric markets. I don’t do a lot of ad tech or fin tech it’s not my core at least but. Nick: Got it. So you in your kind of area that’s pretty focused you probably see a certain sector type of company. You know if you see a few companies that are getting funded that’s kind of the bar at the moment. For that kind of company how mush traction do you need to get funded? And it really varies for per company and then it also varies a little bit you can turn it back if you have track history I mean track record you know of previous exit or something you get investment earlier. What’s actually curious to me is that it seems that in general people are expecting you to have more traction before you get financing from non-friends and family investors. On the one hand that makes sense but is it there a kind of easier company as there’re more and more companies and that is how investors are filtering them out. On the other hand what is playing against that is that more and more investors which means you got to go earlier to get better deals and so it’s been interesting to me how this play out .But it really seems like traction, getting more and more traction is required to get investment in general. Nick: Right I was reading a blog post on twitter Mark Andreesson and Fred Wilson were discussing it but it was a blog post by Fred and they were talking about the requirements at each stage of financing. And it seemed like they were expecting the Trashing piece post series A. And maybe that’s the case in New York or in the Bay Area. But certainly in Chicago the expectation very much is that there’s product market fit and market validation very early on before a formal fundraise. Gabriel: Yeah I mean I think for consumer its different but I’d say certainly for your kind of b2b’s stay that really seems like it’s the case. For your consumer like if you look at Unit Square’s portfolio it’s a little over the map you know though for some areas, it depends on kind of a sub-aerial or something like a subs for that networking thing. I think they do want to see a lot of traction. It’s something that’s more like network and kind of a new area where there’s not a lot of competition meaning they’re willing to invest a little earlier. So it probably varies in its amount but at the very least I think investors are looking for if you even don’t have traction at least have a sensible distribution plan right. There is a quote from Mark Andrees that said and I’m paraphrasing but it’s essentially this the number one reason that we ask startups is because they don’t have a distribution strategy. Nick: Really? Oh. You know I talk with a lot of startups and I ask them questions about demographics; psychographics; the breakdown of their target market; how appropriate is their solution for the target market. Would you also recommend that investors ask these questions about you know what channels are you going through and what have you tested? How does acquisition look and how does engagement look with each of these channels? Gabriel: Yeah absolutely. I mean I believe and we can kind of argue in the traction book we wrote that. You know you should spend half your time as early startups certainly I think pursuing traction. And so it’s a sign if you can’t answer that question then you really haven’t spent any time working on it. Gabriel: So to me its big filter of whether you spend any time thinking about what your distribution strategy is and having tested some things to me that’s kind of a requirement. Now it depends how early you are you know if you’re investing at the ideation process it’s reasonable they haven’t done much and maybe I’ll think them through that. And in many cases what I’ve tried to do more recently is invest in people I’ve known for a while and talk to them during the ideation phase; and kind of watch them validating some of those channels over time, not just getting a snapshot at the time of investment. Nick: Alright switching gears here. Gabriel can you tell us more about what you’re currently most focused on? Gabriel: Sure yeah. I am most focused on running a startup called Duck Duck Go which is a search engine that doesn’t track you. Nick: Yeah tell us more about Duck Duck Go. Gabriel: (laughs). You want a longer answer. Nick: I’m intrigued. I’ve heard so much about it. I know some investors that have invested in Duck Duck Go and I’d like to hear your thoughts. Gabriel: Sure so I started Duck Duck Go at the end of 2007 on personal, kind of personal need ’cause believe it or not I was getting dissatisfied with Google at the time. I’m seeing more spam and thinking that you know I go to all these sights, like Wikipedia, Yelp and they all have instant answers and when you land on a site why can’t those answers be at the top of the surf results? So I really launched it with that basis. Then when I got into it I realized good thesis for the company could be the do things that the big guys can’t do easily and also make really good user search experience. better instant answers are still part of that. and less clutter, which we can do because we just focus on web search whereas the other search engines have all these other properties like Google Plus. And the combination of those, smarter answers; less clutter; real privacy; we think adds to a compelling search experience that appeals to a real percentage of the population. So our challenge is more getting the word out. Nick: Very cool. So you’re an Angel Investor, if we could cover any topic in venture investing on the podcast, what topic do you think we should cover and who would you like to hear speak about it? Gabriel: That’s a good question (laughs). Gabriel: You know it comes down to me about in Angel Investing you would have just a myriad of strategies you can have. And you kind of have to pick one and go with it and you know something just has to make sense to you. So I personally like hearing about and exploring people’s different strategies and the assumptions they have on them. So I guess my answer would be is I’d like to see the podcast evolve to kind of pick apart different angel strategies. And so if you were listening to the podcast overtime, you could really get a sense for the different strategies out there and which makes sense for you and why. Because I think different strategies make sense to different people depending on their geography, their investment focus. All sorts of things like that. Nick: Sure. Anyone in particular out there that you would like to hear talk about their personal strategy? Gabriel: Well I liked; you might have seen my recent post by Jery Neumann about not picking unicorns. I don’t know if you saw that but it was a really nice post on his blog called reaction wheel about his Angel Investment strategy. And his basic point was pick a good market, don’t worry about picking unicorns and invest in a lot of deals and that using your kind of personal expertise. And I would personally like to dig into that a little more with him and kind of dig into this notion of. His argument was, you can’t really pick very well so you should just pick a bunch of things on the market you know well. And I’d love like to tease that a little more about well how; you know people are still making picky decisions. And I think that people are pretty decent at it more than others. And given that how can you tell how high you’re picky and you know kind of frame that a little more and take that a little more into the podcast. Nick: Yeah when Aileen Lee’s articles on unicorns came out I think we all felt this expectation that you got to go out, you got to try and find ’em. But the reality is you can have a lot of wins and a lot of successes without these billion dollar ideas which are a fraction of 1%. Alright so Gabriel, what is the best way for listeners to connect with you? Gabriel: Twitter. I am @YEGG, Y-E-G-G on Twitter. Nick: Okay, he’s @Y-E-G-G on Twitter. The blog is Gabriel Weinberg dot com front slash blog; and pre-order a copy of his new book. 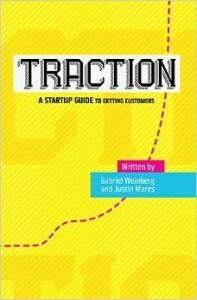 It’s called “Traction a Startup Guide to Getting Customers” and I’ll include a link in the show notes so you can find it. That comes out on August 12. Gabriel thanks so much for the time and I hope we can chat again soon.